I have been eating Dorito Taco Salad for over 25 years. It would always be served at our large family gatherings and it was sure to be the first dish to be empty each and every time. 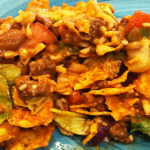 Dorito taco salad – a delicious twist on taco salad that is sure to please a crowd! It combines all of the flavors of standard taco salad with a sweet and tangy dressing and crunchy nacho flavored Doritos. This is always a huge crowd favorite at every event! 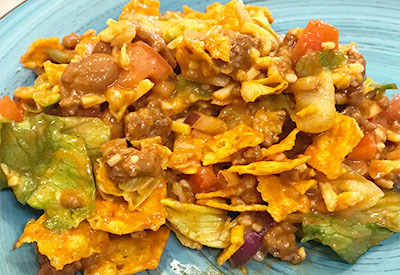 The best part of this Dorito Taco Salad recipe is that it is so versatile. You can easily adapt this recipe based on your taste and preferences. The base recipe is included below, but feel free to add any vegetables or toppings that you and your family enjoy. Taco salad ingredients ready to be combined with the meat, Doritos and dressing. Sometimes I will add in green and sweet bell peppers. Or if I am feeding guests that like things spicy, I will add in diced jalapeno. Some people add in black olives or green onions as well. I don’t like black olives, so I will sometimes have a small bowl of them for others to add them in as they wish. Toppings can be added on as well. How about a little sour cream or guacamole for an extra layer of flavor? And don’t forget to get creative with the flavor of Doritos that you choose. Of course, the standard nacho flavor Doritos works well this recipe. However, you can adjust the recipe to include ranch flavored Doritos. You could even switch out the Catalina dressing for Ranch dressing to make a creamy version of Dorito Taco Salad. Toss all the ingredients together except the Doritos and dressing. The most important thing to remember when making this recipe is to add in the dressing and Doritos right before serving. If you add the dressing too soon, your lettuce becomes drenched and soggy. And you can only imagine what adding the Doritos would do if you tossed them in the dressing and let it refrigerate for hours! 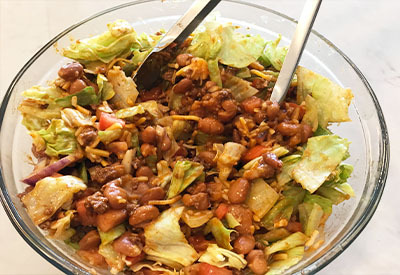 A delicious alternative to taco salad that is a huge hit at every picnic or family gathering! In a medium skillet brown the ground beef. Drain excess fat. And add back to skillet with taco seasoning and water per the back of the instruction packet. Simmer until most of the water has been absorbed/evaporated. Let mixture cool. 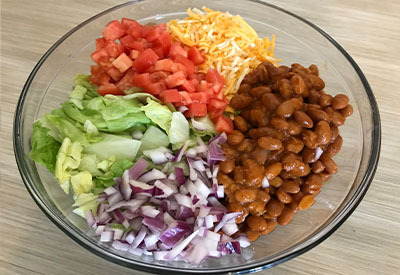 In a large serving bowl, mix ground beef, lettuce, tomato, cheese, red onion and chili beans. Cool in refrigerator until ready to serve. Right before serving add in the Catalina dressing and slightly crushed Doritos and toss gently to coat. We have been making it this way for years. My SIL is where I learned this recipe from. We all like it better even the next day. It just mixes the flavors & the dressing. lettuce &Doritoes being soft doesn’t hurt. It goes so fast at our house.You can use 1 can of tomatoes ,any you like in place of fresh tomato to save on cost .Drain the can first though. I agree, I love the flavors the next day. I will add a few extra Doritos to the top for some extra crunch too. And thank you for hte tip on the canned tomatoes – great idea!